Introducing the all-new GammonVillage Champion Class backgammon sets. These stunning backgammon sets are an unbeatable combination of exquisite craftsmanship, luxurious materials, and stylish elegance. These are world-class backgammon sets, designed and engineered for professional tournament play. The case is made of high-quality Eco leather, with a striking textured accent, painstakingly assembled by expert artisans. The playing surface is an ultra-smooth printed microfiber field that is deeply cushioned, providing an ultra quiet and pleasurable roll each and every time. Each case also features stylish corner protectors, a wide bar for easy checker placement, Eco leather cups with trip lips, tournament grade precision dice, and so much more. We are proud to offer these exclusive backgammon masterpieces to our customers at an unbeatable price. 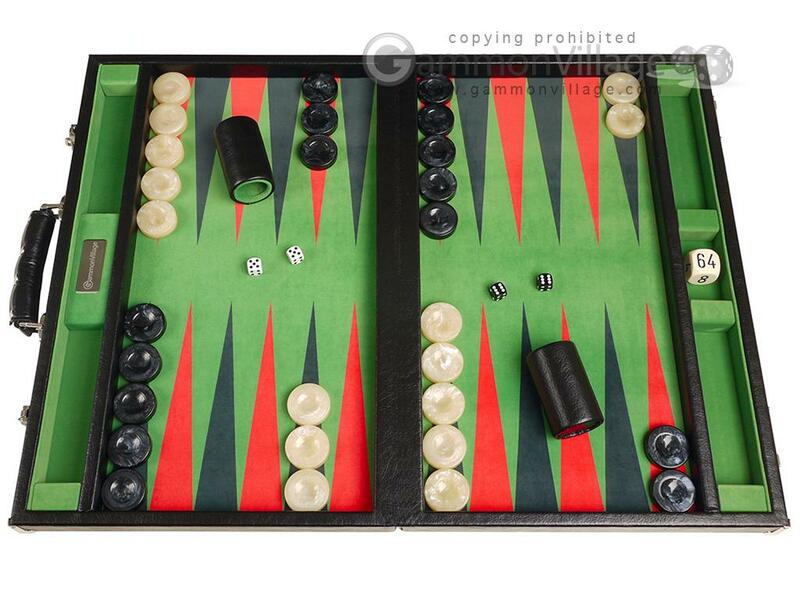 Available in limited quantities, these backgammon sets are ready to ship today! Closed Length: 21 3/4" Width: 14 5/8" Height: 3"
Open Length: 21 3/4" Width: 29 1/4" Height: 1 1/2"
Cup Height: 3 1/4" Width: 2"
Page P5758 Copyright © 1999-2019 GammonVillage Inc., USA. All rights reserved.